From the authors of the popular and bestselling Godwink series comes a new and inspiring collection of true stories about people whose lives were changed by specific and extraordinary answers to their prayers. Prayer is a universal act that anyone can participate in. Simply stated: prayer is a conversation between you and God, and oftentimes brings incredible and astonishing results. The outcomes are called “answered prayers.” Yet, with no alternative word in the English language for answered prayer, readers have begun to fill the void with Godwink, which is now making its way into dictionaries. 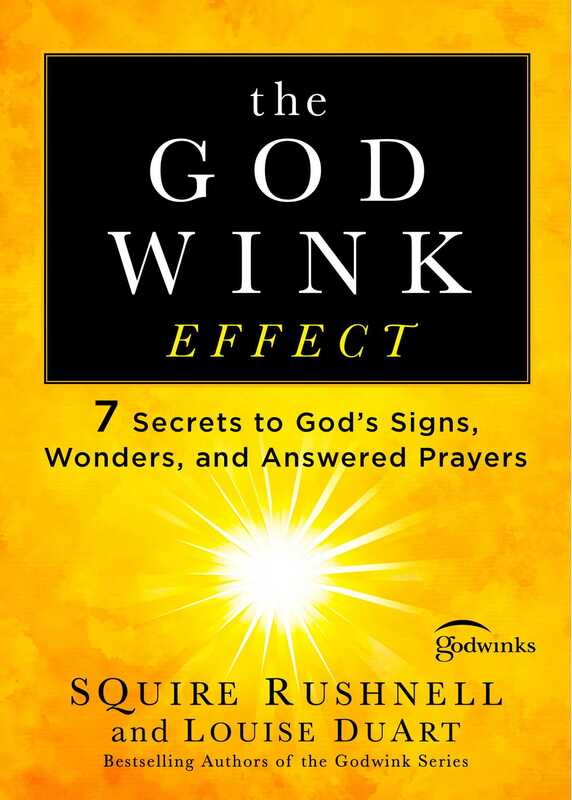 In The Godwink Effect, SQuire and Louise, husband and wife, make the case that Godwinks and prayer are inextricably intertwined. The first of seven secrets for more Godwinks is to pray. Moreover, when a Godwink occurs, like a pebble tossed into a pond, there are subsequent ripples that touch the lives of others. Godwinks and prayer are inextricably linked. When you pray more, you experience more Godwinks. The best prayer is intentional, but God occasionally proves He can hear your heart by answering unintentional or even unasked prayers. In the beginning I was feeling uncertain. Who was I to be spouting this thesis about Godwinks? I’m not a theologian, a philosopher, or a scholar. I’m merely a TV executive. Just one of the guys who brought you Schoolhouse Rock. I’m not alone! I thought. Sir William lifted my spirits by validating my theory that Godwinks are connected to prayer. And this notion existed not just in my head but was held by others! Of course I now joke that I can’t fault the knighted evangelist for failing to use the proper word—Godwink instead of coincidence. The word wasn’t around in the 1600s. So, in partnership with Sir William, we would like to introduce you to the first of Seven Secrets to God’s Signs, Wonders, and Answered Prayers. The first secret, very simply, is . . . pray. When you pray, you clear the way for blessings that are waiting to be released. More prayer, more power. Less prayer, less power. Prayer is mysteriously related to the rate of Godwinks that flow into your life. Simply put, prayer is communication between you and God. You can talk to Him anytime from anywhere about anything, and you can talk to God much the way you would chat with a dear grandfather whom you admire and respect, who hangs on your every word, and who wants to know everything about everything you’re doing, about what excites you and what concerns you. One difference between your grandfather and God, though, is that the latter can literally move mountains and earth to comfort you, protect you, inspire you, and guide you to where you need to go. God hardly ever speaks to us in an out-loud, human voice. It happens, but very rarely. Instead, sometimes you hear an inner voice that seems as clear and as distinct as the words to a song inside your head. That’s infrequent as well. More commonly, you feel a powerful inner sense that you need to do something—go check on the baby, watch that car that’s coming from another direction, say something specific to a specific someone. For most people, however, the most frequent form of direct, person-to-Person communication from God happens through Godwinks. Why not? Why wouldn’t God use a nonverbal and totally amazing way to communicate to let you know that it’s Him? As you develop the ability to see Godwinks all around you, you’ll see more and more of them more and more often. For Louise and me, it is now rare that we don’t see Godwinks several times a day. Intentional prayer is the best kind of prayer: you intentionally speak with God about a very specific need or issue. That’s what Kate Hughes did, and her astonishing story will touch most of us. One medical issue after another drained her bank account, tested her stamina, and gave her a stage on which to demonstrate that when you engage in daily intentional prayer, God listens to you. If you don’t already agree, Kate’s story may change your thinking. Kate sat on the couch, opening mail. One envelope was plump and clearly of a high-quality paper. She carefully opened it. As if it were a precious treasure map, she held the wedding invitation with both hands. It was beautiful. The raised lettering, in script, announced that in about a month her son, James, would marry his fiancée, Dana, in Sedona, Arizona. Kate broke down in tears. Regaining her composure, she sighed audibly and unconsciously ran a finger over the lettering on the card. The statement was matter-of-fact because Kate was strong in her faith. In her daily chats with her Creator, she always spoke in a conversational tone. She believed God listened not only to her prayers—and answered them, according to His will—but also to her heart. She knew that He knew how desperately she wanted to be at that wedding! He also knew she was flat broke! With only a part-time job and piles of medical bills, there was no way on earth she could afford a plane ticket from Melbourne, Florida, to Arizona. Her recent phone conversation with Dana and James had been sad. Aware of her situation, the bride and groom wanted her to know the invitation was going out. They knew she’d been praying and praying for God to provide a way for her to attend. They truly wished they were in a financial position to be able to get her there, but that wasn’t an option. No one had a solution. All three of them cried. For several years Kate had been dealing with some serious health issues. First, an auto accident left her with a fractured back. Then she was diagnosed with breast cancer and underwent a double mastectomy. After that, a heart disorder that had lingered since childhood required open-heart surgery. Next was the grim discovery that she’d suffered a stroke. During this time the company she worked for collapsed and her mortgage underwriter job disappeared. Managers at a second mortgage company had no patience with her health problems, so she lost that job and couldn’t find other work. Yet Kate stood by God because she knew that He stood by her. Her faith was tested, yet she refused to let any of these circumstances rob her of her joy. She maintained her upbeat personality and kept her vow to make at least one person smile every day. When a server’s position turned out to be too hard on Kate physically, Jeanne suggested she might be better suited to work as a cashier. Again and again Jeanne saw the wisdom of the decision to have Kate work as a cashier. But what Jeanne didn’t know was that she herself was a Godwink Link. (That’s the term I’ve coined for someone who delivers another person a Godwink without even knowing they’re doing it.) Jeanne had no idea that her decision to hire Kate when others wouldn’t would set the stage for Kate to experience the biggest Godwink of her life. Kate was thrilled to get the part-time job as a cashier. It didn’t completely cover her needs, but she would keep praying for another part-time job to cover her shortfall. As Kate prayed and waited, Cracker Barrel treated her well, and her coworkers felt like family. So she always arrived a half hour before her shift to deliver cookies or just spread a little joy. And her job as a cashier continues to be a great fit. We can all learn from Kate. When, like Kate, we greet each day with an attitude of gratitude for the things God has given us, rather than donning a cloak of dark resentment for the burdens we must bear, He lets others see the joy in our hearts as He shines through us. Some will see—but not necessarily recognize—God’s love in our warm smiles and welcoming ways. A few people will know the true Source of Kate’s thankful spirit and ours. When the week of the wedding came, Jeannie considerately saw to it that Kate’s schedule required more work hours than usual to help her keep her mind off the big event. When Kate looked over the schedule, she appreciated that it called for her to work on Saturday, the day of the wedding, as well as the evening before. So on Friday Kate arrived for work at three thirty, greeted her colleagues, put on her uniform, and, promptly at four, took her place behind the register. It was Rose, one of Kate’s coworkers, as she walked past the cashier’s station. Kate knew Rose had been out of the loop, because pretty much everyone else had known for weeks that she would be missing the wedding. “Well . . . I was feeling pretty good . . . till you mentioned it,” Kate replied with the best smile she could muster. “You’re missing your son’s wedding?” inquired the woman, who had obviously overheard the exchange with Rose. “Well, why don’t you sneak me onto the plane, strap a parachute on my back, and shove me out over Phoenix!” Kate giggled. The airline workers paid their bill and said good-bye. Kate continued ringing up customers. Moments later she looked up and was surprised to see that the airline workers had returned. Both wore wide smiles. The woman glanced at Kate’s name tag and spoke first. “Can you get tomorrow off?” asked Ruben. “We found two Southwest Buddy Passes in our bags in the car. Those are standby tickets to get you to Phoenix and back,” Ruben continued. Kate was dumbfounded. Her eyes began to fill with tears. “Oh my! Thank you—and thank You, God!” said Kate as she put everything together and realized what was happening. I don’t believe this! thought Kate as her oft-uttered prayer flashed like a neon sign in her mind: God, I know that if You want me to go to this wedding, You’ll make the way. “Well, then, let’s see how we can get you there,” said Angie, pulling out her cell phone. “What time is the wedding?” asked Ruben. “Sure,” said Kate, dazed by what was unfolding. A small group was now gathering around her, all smiling joyfully. Everyone was feeling the excitement. Before they left the restaurant, Angie handed Kate a business card with her number on it. “Let us know how you make out,” Angie said, smiling sweetly. A short while later Kate was in her car, driving home to pack, grab about an hour’s sleep, and then get up for the one-hour drive to Orlando Airport. Later on, when she had time to reflect, she would clearly see that first Jeanne and then Angie and Ruben were all Godwink Links. Each of them was an unwitting player in a drama that became Kate’s best Godwink ever! This experience reaffirmed for her that prayer works . . . and that when you are faithful to God every day of your life, when you remain in conversation with Him, He is right there beside you and faithful to you! When Kate landed in Phoenix, she found her way to a bus to Sedona, learned the drive would take two hours, and was soon on her way. By the time she was close to her destination, Kate had made friends with the woman sitting next to her. Kate’s excitement was visible. “I can’t wait to surprise everyone!” said Kate, beaming. “No one knows I’m coming. But I have a sense from God that when I walk into that hotel lobby, I’m going to see my eleven-year-old grandson running around.” She laughed and added, “Most of my grandchildren call me Grammie, but Ethin made up a new name. I called him ‘Pumpkin’ one time, so he decided to call me ‘Cupcake.’?” She laughed again. About two p.m. Kate walked through the front door of the hotel. It was Ethin, just about to get on the elevator. The boy ran to Kate and hugged her. “Then let’s get busy,” said Kate, lifting an eyebrow and smiling at her co-conspirator as she nudged him toward the front desk. There she shared her secret with the attendant, asking if she would call up to her son, James Kramer, and tell him there was a time-sensitive package for him in the front lobby that he had to come down right away and sign for. James was feeling a bit annoyed. He had to finish getting dressed, he needed to be at a particular place for the bridal party photo shoot at a particular time, and now the front desk was insisting that he go downstairs right away for a “time-sensitive” package. What the heck could be so time-sensitive? he kept asking himself as he rode down the elevator. When the elevator doors opened, there she was! His mother! “Wha— Wow—Mom! What are you doing here?” he blurted with a huge smile. He took her in his arms and gave her a bear hug. She couldn’t help giggling. This was definitely the best surprise ever! A few minutes later Kate walked into the beauty salon and saw that Dana, the bride-to-be and her future daughter-in-law, and her daughter, Michelle, were standing at the register settling the bill. They were turned away from her. “You two look beautiful. Are you attending a wedding?” asked Kate cheerfully. “Oh, Mom, this is so typical of you,” added Michelle, grinning. The three women air-kissed—they didn’t want to mess up the makeup!—and said they couldn’t wait to hear the whole story. Right now, though, Dana and Michelle were late for the photo session. It turned out to be a beautiful wedding. The next day, before heading back home, Kate had her heart warmed again. She had a long-harbored mother’s concern that her son was not yet strong in his faith, but what she saw brought her to tears. My wedding day was just made perfect. My Mom surprised me as I knew she couldn’t afford to come. I would love to thank the flight attendants that gave her a round trip ticket . . . they have, along with my new bride, strengthened my belief in God. Upon arriving back in Melbourne, Kate couldn’t wait to call Angie and Ruben to thank them again and provide the full wedding report that she’d promised. Angie was excited and wanted to hear every detail. Then she asked a question. Kate blinked. Could this be the other part-time job she had been praying for? Another Godwink? “Uh, yes! I could be your nanny!” said Kate. Once again she was amazed. Wow, God! You sure do answer prayers, don’t You! Louise and I have observed that Godwinks happen more often when you step out in faith and interact with others. As adults, however, the very act of talking to a stranger sometimes opens the floodgate for Godwinks. When you engage other people in conversation, as Kate did, you often position yourself for God to accomplish His purposes. As you saw, He put two strangers in Kate’s path—Angie and Ruben—who became Godwink Links to answers to her prayers. A primary takeaway from Kate’s story is the power of intentional prayer to produce subsequent Godwinks and answered prayer. Daily, Kate prayed a specific request to God. • Largely because of her upbeat personality, Kate got her first job, not in the mortgage field, but at Cracker Barrel. • Kate prayed daily—and intentionally—for God to “make the way” for her to go to her son’s wedding if God wanted her to go. • Two kind-hearted flight attendants, Angie and Ruben, “just happened” to be in the cashier line as coworker Rose “just happened” to ask why Kate was not attending the wedding. • Angie and Ruben “just happened” to discover unused standby tickets that they could give to Kate. • And Angie “just happened” to need a nanny, giving Kate an answer to her prayer for a second part-time job. On other occasions your prayer may be unintentional, almost a casual conversation with God. Ted’s heartrending story below proves that, whether prayers are intentional or unintentional, God is paying attention. It was an hour before dawn and still dark. Unable to sleep, Ted strained to sit up in bed, struggling with the familiar heaviness of the unbearable, inescapable, unrelenting sadness that had weighed him down for one year to the day. Prior to this day a year ago, Ted could at least cling to a thin thread of hope. Then . . . the thread snapped. How he hated to have to make that decision, to have to put his “precious angel” Kathy under hospice care on the eve of her favorite holiday, Christmas. Am I calling for assistance too early? he wondered at the time, questioning the apparent insensitivity of the timing. Will the children forever remember their mother’s special holiday as the time Dad called in hospice? But what choice did he have? The ravages of ovarian cancer had claimed Kathy’s body. Every doctor and every adviser said there were no more options, there was no hope. And though she was close to dying, no one could have known that she was so close to the end. Still, did I do all that I could? That’s when Ted knew he needed to have help. God, don’t let me get in Your way, he had prayed silently. Hospice had been wonderful. He recalled how skilled professionals responded quickly with a hospital bed and pharmaceutical supplies. They didn’t immediately assign a hospice attendant but instead patiently guided him through this uncharted experience, providing him with careful instructions on how to medicate Kathy as needed. Ted shuddered as he replayed the prior Christmas Eve in his mind. Kathy had begun to cry out. The new medication was making her delirious, and she kept trying to get out of bed. Finally, after what seemed like hours, her eyes closed. But then Ted began to worry that perhaps she had gone into a coma. He was tormented, wondering if she would wake up. What if I didn’t get to say good-bye? he thought, and a lump formed in his throat so big that it hurt. Distraught, Ted placed his head in his hands. Soon he succumbed to pure exhaustion and slept on the floor for a few hours. When he awoke on Christmas morning, Kathy was sitting up in bed! She was alert! More alert than she had been in weeks! “Do you have those books I bought for the boys?” she said, referring to two of their grandchildren. “Yes, of course,” said Ted, puzzled by her odd-but-welcome turnaround. He got the books right away. They were identical copies of The Night before Christmas. By clicking a button, she could read the story aloud and record it so the child could play it back over and over again. In clear diction Kathy read each book all the way through. Ted was astonished by her stamina. As he wrapped the books in bright red paper, he couldn’t help but think, given the circumstances, what a treasure these books would be for those boys. Long into the future they would be able to hear the classic Christmas tale told in their grandmother’s gentle voice. Later that day, Christmas afternoon, Kathy weakened. This time, she slipped into a coma from which she never returned. The first anniversary of the loss of a loved one is always a mighty test of faith. As much as you’d like to avoid it, that date creeps toward you like an ominous dark cloud before a storm. You hope it’ll just pass on by—quickly. Ted put on his robe and walked into the den, illuminated only by the lights on the tree. Before going to bed, he had finished the decorating, trying to put everything into exactly the place where Kathy would have wanted them. She was known for decorating to the hilt. There was hardly a spot—inside or outside the house—that didn’t celebrate the birthday of Jesus. Ted hung the stockings over the fireplace, draped the garlands here and there, and, very carefully—as she always reminded him—threaded the special family ornaments onto sturdy branches, making certain they were secure. Now, in the slight chill of morning, he dropped into a chair and reassessed his decorating accomplishments in the dim, multicolored light from the tree. As Ted studied the decor, he couldn’t help but smile at the memory of Kathy’s holiday exuberance. At this time of year, she was like a grown-up kid. As if he were pulling the snapshots from a mental album, he pictured her Christmas ritual of handing out personalized ornaments to Ted and each of the children. Those ornaments had now multiplied to two or three dozen. Each had a prominent place on the tree, except for the ornament she gave to Ted one season—the little ceramic picture frame that sat on the table beside his chair. Kathy was afraid the frame might be a little too heavy to hang on the tree, so she always set it on the side table next to a Christmas candle. As Ted gazed upon the ornament, his eyes started to moisten. Inside the frame was Kathy’s smiling face—just the way literally everyone remembered her. Kathy always smiled. Her photo was flanked by ceramic red-and-white candy canes, and across the top of the frame were the words Merry Christmas. Oh, how Ted missed her. God, please help me get through this holiday. Ted knew that if he pushed that little button at the top of the picture frame, it would play a recorded message. He recalled that you had to press it with a fingernail, just right, to get it to work. But he couldn’t bear to do that. He couldn’t bear to hear Kathy’s voice. He had teared up the first time he heard it—and every year since. He knew that if he pushed that button now, he would cry like a baby. Oh, God . . . if only she were here . . . Forcing his thoughts in another direction, Ted determined it was still too dark in the room. Kathy always said that candlelight warmed up a room, so he pulled himself from the chair, went to the fireplace, picked up the lighter, and flicked the flame to light the candles on the mantel. Returning to his chair, he flicked the lighter again to ignite the candle on the side table, next to Kathy’s picture. Suddenly he was jolted. It was as if an electric shock had run through him. Kathy’s voice was coming from the picture frame! Ted’s mind searched for an explanation. I didn’t touch that frame. All I did was light the candle next to it! Again he flicked the lighter to ignite the candle, and again the voice of his dear wife came from the picture frame, mysteriously filling the quiet of the room! Ted fell into the chair. And cried. A peace that surpassed all understanding began to flow over Ted. He knew that this was a Christmas Godwink he would never forget. 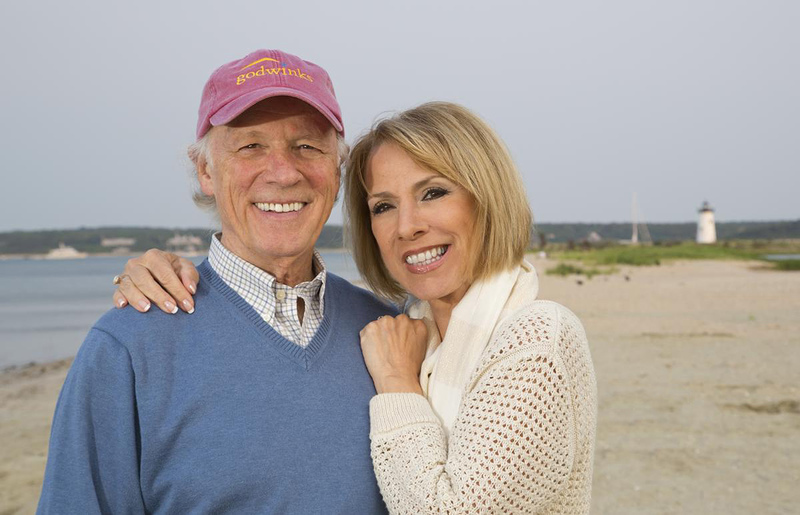 He knew that God—and possibly his “angel” from heaven, Kathy herself—was sending a person-to-person link of joy to lift his spirits. Ted smiled. Almost giddy with joy, he flicked the lighter close to the frame again and again. Ted Harris believes that, although his prayers that morning were unintentional—he wasn’t on his knees with folded hands, intentionally speaking to God—he was nonetheless in a state of prayer that had carried him through many days of grief. Ted often chatted intentionally and directly with God, and Ted had definitely felt God’s presence, right there by his side and Kathy’s, during her last days this side of eternity. God is always present with you. Even if you may not be speaking directly to God, He loves you so much that He feels your every hurt and knows every tear you shed. He looks at your loss, disappointment, conflict, and sorrow with compassion and love. So even if you don’t intentionally pray to Him, God knows what kind of comfort you need exactly when you need it. A year and a half after Kathy graduated to heaven, Ted was still visibly grieving his loss. Old friends who lived near Fort Worth, Texas, were prompted to throw a party for him. Ted felt he had no choice but to go, so he drove up from Houston to attend. As he entered their home, he saw the banner. One of the people who had been invited was Jan McNeill, one of Ted’s classmates at Texas Christian University forty years before. Their conversation rekindled fond memories. Jan had been quite content with her single status for twenty-two years, but Ted’s warm personality and sense of humor reminded her of years gone by. They began to date, and six months later they were married and began new chapters in each of their lives. We’ve seen how Kate spoke with God intentionally and how Ted spoke to Him unintentionally. But sometimes when you are overcome by the emotions of a situation, you find when you look back that you were neither intentional nor unintentional when you needed help. In fact, your request of God was actually unasked. Your prayer was not even prayed. Patrick’s eyes were drawn to the girl with the engaging smile and stylish outfit who was gliding across the dance floor with energy and grace. He was the new kid in school, and this was his first seventh-grade dance. “Who’s she?” he asked the kid next to him. Margery noticed the new guy staring at her. As she exited the dance floor, she “just happened” to end up right where he stood. Her smile was natural and sparkly. They spoke, and a conversation began. Within days, everyone knew that Pat and Margery were an item. Throughout high school Patrick Godfrey and Margery Southworth were a popular couple, attending most basketball and football games, class outings, and dances. When high school came to an end, Margery approached the future with certainty: she selected a college in New Mexico where she would study biology. Patrick was uncertain about his future. With no firm plan, he found himself lured to Hawaii to join a Tahitian band. Life went on. And on. The two high school sweethearts drifted apart. Margery became a career woman with Schick Safety Razor Company. She worked hard and felt accomplished. Still, she prayed that one day she would once again enjoy the kind of love she once felt with Pat. Patrick made poor choices. He fell into two ill-conceived marriages, both ending in divorce. He concealed his hurts with alcohol, and as his life spiraled downward, his alcoholism intensified. Patrick very much wanted to rebuild his life, to leave behind his rudderless existence and start living with purpose. In order to raise his two young boys and gain some stability, he moved in with his mom in Palos Verdes, California, and got a job in Hollywood. He was sober and determined that his path would be straight. One Sunday afternoon, he and his mother were looking through an old photo album. The pictures from high school brought back memories of a better time. When he turned the page to a shot of Margery Southworth and himself, his heart leapt. He missed her sweetness, her agreeable nature, and her sparkling smile. “Why couldn’t I have married Margery Southworth in the first place?” he said to his mother, shaking his head slightly. Suddenly he had an overwhelming compulsion to find her. He asked his mother for the Los Angeles phone directory and began calling every “Southworth” listed. After numerous dead ends, he realized it was an impossible task. Margery couldn’t be found easily. Perhaps she was married and had another name. Maybe she’d moved away. He felt a deep sadness. His mother said he was crazy. You could tell from the look on his mother’s face that, as much as she would love to see her son happy and grounded again, she worried that finding Margery might only bring him more disappointment. She didn’t want him to have yet another source of pain. As he placed his head on the pillow that night, though, images of Margery’s sweet smile flashed through his mind as he replayed his words from earlier in the day: Why couldn’t I have married Margery Southworth in the first place? Was Patrick unintentionally praying to find his high school sweetheart? Was he asking for God’s assistance—for an answer to prayer, for a Godwink—without even realizing it? Maybe. What we do know is that God was listening. The next morning Patrick began his daily one-hour commute to Hollywood. It was his custom to take the most direct route. But for some unknown reason, this morning Patrick had the unreasonable notion to take an alternate route, via Santa Monica. Knowing this would add thirty to forty minutes to his drive, he nevertheless went that direction. And he had no idea why he was doing so. As Patrick pulled onto the long, two-lane ramp onto the 405 Freeway north, he slowed to a stop at the traffic light that managed the flow of cars onto the highway. He heard a beep. He looked toward the van that was alongside him. He saw a beautiful woman with large sunglasses. Looking directly at him, she slowly lifted her sunglasses as if she were in a scene from a movie. What? It was Margery! How could that be! Patrick was shocked. How could this have possibly happened, less than twenty-four hours after he had received a sudden nudge to look for her? And when he was driving on a route he never took? Overcome with emotion, he began to laugh . . . and then cry. Completely overwhelmed, he laid his head on the steering wheel in utter disbelief. But he didn’t stay in that position for long. The cars behind him were beginning to honk. Soon there was a cacophony of horns as he looked again at the object of his dreams. Regretting that he had no choice, he proceeded up the on-ramp, soon to be immersed in the sea of cars on the freeway. But he stayed to the right in case Margery could see him and so that he could pull off at the next exit. He put on his right-hand turn signal. He looked in the rearview mirror, and she responded by turning on hers! On the side street, Patrick and Margery chatted and laughed together for several minutes before both realized they needed to get to work. But Patrick was thrilled. Learning that Margery was not married, he had gotten her phone number and promised to call. He couldn’t wait to call his mother to tell her what happened. She whooped with glee. She loved Godwinks, and this one was unimaginable! One week later Patrick and Margery went on their first date. All the joy and love of their high school romance was rekindled. They laughed and talked for hours, and once again they were an item. One year later they were married and have lived happily ever after ever since. • At the time there were thirteen million people in the Greater Los Angeles Area and some four million highway vehicles. • How could God cause two of those vehicles to be side by side on the same freeway ramp at the exact same moment? • And how did He make it happen less than twenty-four hours after Patrick was calling all the Southworths in the LA phone directory? God is so tuned in to our lives that He listens even to our unarticulated prayers, and sometimes in response He delivers astonishing Godwinks. Have you made bad choices and wondered if God could turn your life into something wonderful and worthwhile? If you answered yes, you have a lot of company on this planet! When he uttered those words, “Why couldn’t I just have married Margery Southworth in the first place?” Patrick had no idea that God had a plan for turning his life around and making it something beautiful. Those words formed a prayer, an unintentional and unarticulated prayer. God heard Patrick’s heart and swiftly went into action to divinely align him with his childhood sweetheart. What a Godwink! God will never waste your pain. Only you can do that. God is in the salvage business, and He is just waiting for you to give Him your junk so He can turn it into treasure. that will be revealed in us. For the past decade Louise and I have been champions of Partnered Prayer: of praying with another person on a regular basis. To help people do that, we developed the 40-Day Prayer Challenge™—a commitment to pray with someone for five minutes a day for forty days. Hugh and Joyce Pemberton decided to take the 40-Day Prayer Challenge. To put it another way, they entered into intentional Partnered Prayer for six weeks, and they were astonished to discover—as most people do—that praying consistently with another person expands the power of your prayer and divinely aligns your paths with Godwinks He wants to bless you with. For Hugh and Joyce, life was good. Retired in Winter Haven, Florida, Hugh at seventy years old played golf four times a week. Their four kids were grown and on their own. The Pembertons had sold their successful business, and Hugh and Joyce had bountiful reasons—in their individual prayers—to thank God for blessings. Then Hugh began having difficulty breathing. Why? What was going on? He had never smoked, he had led an active life, yet in October 2013 he was diagnosed with a lung ailment—interstitial pulmonary fibrosis—that can only be cured with a lung transplant. If that news weren’t bad enough, the first two doctors he consulted said that, at age seventy-two, he was too old for the procedure! Hugh’s condition worsened, and he went on oxygen in October 2014. In the beginning he required three liters of oxygen per hour. Still, he maintained his faith and his fortitude, even dragging a small oxygen tank on wheels behind him wherever he went, including on the golf course. More and more worry crept into Hugh and Joyce’s private thoughts—more worry than they shared with friends or even with each other. On a flight to visit her dying sister in Michigan, Joyce took a seat between a Navy veteran and his traveling companion. In conversation with the vet’s companion, Joyce was astonished to learn that the woman’s husband had the same lung diagnosis as Hugh! Sitting in that particular seat turned out to be the first in a series of divinely aligned Godwinks. Joyce learned that the doctor who treated the woman’s husband was the head of the Pulmonary Research Department at the famed Johns Hopkins Hospital in Maryland. Hugh and Joyce have a daughter in Maryland, so they arranged to visit her and, while they were there, get a second opinion on Hugh’s condition from the doctor at Johns Hopkins. Hugh and Joyce were ecstatic when the doctor gave him hope, assured him that he was not too old for a lung transplant, and told him the person to contact at the Tampa General Hospital’s transplant program upon his return to Florida. And Hugh did. After an interview with the team, he was scheduled for three days of testing and afterward was approved for the transplant list on December 5, 2015. It came none too soon: Hugh’s oxygen requirements had doubled to six liters per hour. There was nothing left to do but pray and wait for a donor. The primary factors for matching a lung transplant donor to a recipient are compatible blood and tissue types and height. The heights of the donor and recipient need to be within two inches of each other. Over the next four months, Hugh’s hopes were raised twice . . . and dashed twice. Both times the news was that the donor criteria had not been met. Hugh’s health was now deteriorating rapidly. Joyce had to help him with everything. She clothed him, bathed him, and pushed his wheelchair. Whenever he moved from his bed to the wheelchair, he had to sit for fifteen minutes just to catch his breath. And his oxygen requirements rose to twenty liters per hour! The situation didn’t look good. When Hugh went on the transplant list, a pulmonary doctor at Tampa General told him that he had eighteen months to live, but based on the way he felt, Hugh was convinced he had considerably less time. Hugh and Joyce continued to pray individually and, despite the difficulty, to regularly attend services at First Presbyterian in Haines City, Florida. At that church, the prayer teams in the congregation continued to pray for them. On April 10, 2016, Louise and I spoke at First Presbyterian. We had been invited by our friend and former pastor Jeff Winter and his wife, Judy. Their personal story about the power of Partnered Prayer was featured in our book The 40-Day Prayer Challenge. In that story Jeff confessed that he was like the many busy pastors who prayed with their congregations on Sunday mornings and with their families at meals, but it hadn’t crossed his mind to pray with Judy every day. Jeff and Judy told of extraordinary results from the 40-Day Prayer Challenge, including an amazing return to faith by their son who had lost his way and become addicted to alcohol. Overnight Kyle turned his life around. Today he has a family and is serving as a missionary in Cambodia. So Jeff and Judy wanted to share the power of Partnered Prayer with their congregation in Haines City. For several weeks Jeff promoted our upcoming visit to the church as something people should not miss. As arduous as it was, Joyce and Hugh got to church early that Sunday to claim one of the prime spots reserved for wheelchairs. Upon hearing the convincing stories of how prayer becomes exponentially more effective when two people pray together, Hugh and Joyce immediately resolved to take the 40-Day Prayer Challenge. They committed to pray with each other for five minutes a day for forty days. The next morning, April 11, they began. The five minutes were a little awkward at first, and they felt quite vulnerable. After all, Partnered Prayer is very intimate. They soon found themselves thinking that they needed to move from rote communication with God to a heart-to-heart conversation with Him. They also began praying for doctors to find a lung donor and for God to allow Hugh to live a long life so he could serve Him here on earth. On April 13, Joyce felt a nudging, a sense that she was ill-prepared for upcoming events. The thought that the tires on their car might need to be replaced also crossed her mind, so she stopped at a tire shop. “You shouldn’t drive that car out of the driveway” was the mechanic’s grim assessment. He added that there was an hour-and-a-half wait to get the job done. Because she was hosting a dinner party that night, Joyce told him she’d return on another day. Yet, as she began to pull from the tire shop, Joyce felt another nudge. She realized that Tampa General Hospital was an hour and a half away and that the mechanic had just told her she shouldn’t even leave the driveway. She turned around and went back to wait. She would have the tires replaced right then. She got home almost two hours later, at five p.m. When she went into the house, Hugh was on the phone. The Tampa General Hospital representative was telling Hugh that a lung donor had been identified and that he needed to get to the hospital as quickly as possible. If everything was in order, they would begin the surgical procedures at four the next morning, April fourteenth! Within minutes Joyce canceled their dinner party, and they were on their way, thanking God for the impending answer to their prayer . . . and for the Godwink timing of four new tires to get them safely to the hospital! And that’s how Hugh and Joyce discovered for themselves how amazing the outcomes can be when two people pray together. Only three days after they began the 40-Day Prayer Challenge, Hugh received his transplant. Two days later, though, he realized it was a bigger blessing than he’d thought. That was when he learned that, during surgery, the doctor had determined Hugh would receive two new lungs, not one! Wow! Twelve weeks later Hugh was once again on the golf course, laughing with his buddies and playing his first game in months. God had given Hugh a second chance at life through a series of amazing Godwinks. Let’s look again at the ripples of the Godwink Effect. Hugh and Joyce had received the devastating news that he needed a lung transplant to live but was too old to qualify. They prayed—individually—for positive resolution to this very dismal situation. As we look back, we have to wonder . . .
• What if when Joyce boarded the plane, she had not been seated next to a Navy veteran whose traveling companion had a husband who suffered from the same medical condition as Hugh did? • What if Joyce had been quiet that day rather than engaging the companion in conversation? She wouldn’t have heard about Johns Hopkins Hospital’s pulmonary program, information that prompted her to make an appointment with the doctor of the woman’s husband, an appointment that gave Hugh and Joyce hope! • Then, what if Jeff and Judy Winter had not taken the 40-Day Prayer Challenge? And what if they hadn’t been passionate enough about their experience to want to share it with their congregation? • What if Hugh and Joyce had continued to pray separately? What if they had not decided to take the challenge to elevate the power of prayer by praying together? And after Hugh and Joyce had waited four months for a donor, isn’t it just like God to provide them with an awesome answer to their Partnered Prayers only three days after they began the 40-Day Challenge? And then God answered their prayers with two lungs, not one! We can go on and on. What if Joyce hadn’t responded to those nudges from above to get the tires replaced? Would they have gotten to Tampa General in time for Hugh to be prepped for surgery? The Godwink ripples on the lives of Hugh and Joyce are now much more obvious because, although we live our lives forward, we understand them backward. And we are wise to take the time to catalog God’s favor in order to better appreciate the impact of our prayerful communications with Him. A reader wrote this to us: Godwinks happen when you allow them to happen. If we think about it, Godwinks are probably not likely to occur very often among people who refuse to allow God into their lives or refuse to acknowledge that He even exists, let alone believe that He is a benevolent presence in our lives. But the situation is different for those of us who believe that we have been created by a God Who cares about us, Who allows us the free will to make our own choices even when those choices are unwise, unhealthy, or wrong, and Who forgives us for our errant ways when we simply confess those sins. We who believe in that manner are the ones who will begin to see Godwinks every day. And—as Louise and I have discovered—the more we converse with God through prayer, the more astonishing the Godwinks will be.